We've racked up thousands of miles on our fitness bands of choice pounding the showfloor at CES 2014 this week to find you the best of the best tech that the show has to offer in TechRadar's Best of CES 2014 Awards sponsored by DTS. This year's show has had everything from cameras to cars, Bravias to Bayhem - so it's been no small feat to whittle the huge array of products launched down into a greatest hits collection. 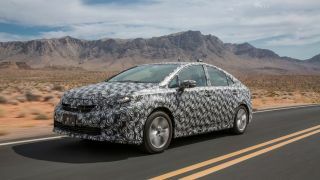 But some products stand head and shoulders above the rest, touting envelope-pushing tech, environmental credentials and pure lust factor: so take a bow, Toyota FCV, TechRadar's Best in Show. Yes, car tech is officially on the map as our expert judges award the hydrogen-powered car the top spot and Toyota planning to mass produce the car in 2015. But on to more traditional tech: our favourite phone of the show is Sony's Xperia Z1 Compact proving that good things really can come in small packages, while Samsung racked up Best Tablet with its 12.2-inch Galaxy Note Pro 12.2. It's been a decent year for gaming as Sony's game-streaming service Playstation Now does away with the console so you can play PS games on a TV, phone or tablet, earning it the title of Best App/Software. Is 2014 the year that wearable tech finally hits the mainstream? Looks like it, with the LG Lifeband Touch taking Best Fitness Tech and the swanky new Pebble Steel nabbing Best Wearable Tech. But it was Valve's Steam Machines that stole hearts and minds as it took the People's Choice award for generating the most excitement and buzz on the show floor and online.